Background: Biphenyl derivatives are an important component of many natural products and used in the treatment of conditions such as anxiety disorders, infections, and insomnia. In addition, the synthesis of these molecules is very important due to their kinase inhibitory effect as well as their antibacterial and antifungal effects. 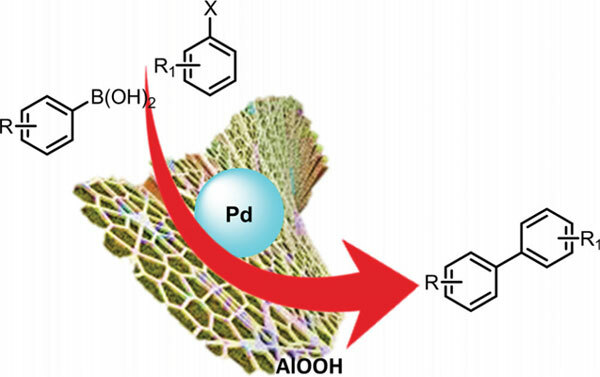 In this study, highly efficient and reusable Pd/AlO(OH) Nanoparticles (NPs) were used as an alternative heterogeneous catalysts system for the coupling reactions. Methods: Pd/AlO(OH) Nanoparticles (NPs) was characterized by SEM, XRD and TEM. Later, Pd/AlO(OH) nanoparticles were performed for coupling reactions. At the end of the reaction, the main products were checked with GC and the GC yield calculated. The desired biaryl products were successfully obtained within 2 h with good yields in the presence of Pd/AlO(OH) nanoparticles. Results: The morphologies of the Pd/AlO(OH) NPs were characterized by scanning electron microscopy (SEM) and x-ray diffraction (XRD). The determination of the appropriate reaction conditions for the desired biaryl products is of crucial importance for successful synthesis. For this purpose, optimization of the conditions for conversion of iodobenzene to biphenyl.was carried out in detail. The reusability of the PdAlO(OH) NPs was also examined for Suzuki Cross-Coupling Reaction. On the other hand, the high temperature and type of catalyst are the factors that make it easier to reach the activation energy. For this reason, the comparison of the designed catalytic system with recently published works are given for Suzuki cross-coupling of bromobenzene with aryl boronic acid. Last but not least, the reaction mechanism of the Suzuki cross-coupling reaction has been entirely identified in the presence of PdAlO(OH) NPs. Conclusion: A novel method was developed for the synthesis of biphenyl derivatives in a short time with high yields by the help of Pd/AlO(OH) NPs at room temperature. As starting materials, neither phenylboronic acid, nor aryl halide derivatives are water soluble, so it was desirable to conduct the reactions in water/isopropyl alcohol as an eco-friendly solvent. Thus, the developed method is both ecofriendly and economical and can be considered as a viable alternative to prior methods appearing in the literature. Coupling reaction, highly efficient, monodisperse, Pd NPs, biphenyl derivatives, heterogeneous catalysts.